Buzline introduces the Riff-Rocker a miniature USB guitar controller. Just plug into your PC and start playing anytime - anywhere! The pocket-sized guitar functions just like other widely popular guitar controllers but costs a fraction of the price. The Riff-Rocker is portable, easy to use and fun to play! Riff-rocker allows users to play games online and off! Play Jam Legend online or download Frets on Fire offline! Riff-rocker is compatible with Windows, Mac OSX and Linux! Each Additional Ink Color or 2nd Side, Add $0.25 All Quantities. Product Dimensions: 6.5" Wide x 2" Tall x 3/8" Deep - 4 foot long USB cord. Imprint Area: 3/8" Tall x 1 1/4" Wide Pricing Includes: One color imprint. Add $20 for additional color. ABS Plastic. Easy to Use, No Software Needed. Plug and Play Into PC and Mac Computers Through USB Port. Compatible with Windows 7/ME/2000/XP/Vista and Most Mac Applications. Please note flash drive samples are subject to availability. Absolute minimums required. Pricing is directly tied to the volume purchase. No special pricing applies. Lanyards available at an additional charge. Product Size (H x W x D): 3 1/4"h x 2 1/4"w x 333/1000" d Imprint Area: Top 1/2" h x 1 1/2" w Packaging: Standard Packaging includes individually bubble wrapped. Pieces Per Box: 100 Weight Per Piece: 0.05 lbs. Weight Per Box: 5 lbs. Case Dimensions: 10" l x 8" w x 6" h.
CF07 is a medium point pen. Both USB Drive and Laser Pointer. Easy to Use, No Software Needed. Plug and Play Into PC and Mac Computers Through USB Port. Compatible with Windows 7/ME/2000/XP/Vista and Most Mac Applications. Capacity from 512MB to 8GB in v2.0. 3 Week WorldDirect Delivery. Includes Button Cell Batteries. Absolute minimums required. Pricing is directly tied to the volume purchase. No special pricing applies. Please note flash drive samples are subject to availability. Product Size: 5 1/2"h x 5/8"w x Imprint Area: Barrel of Pen 1/4" h x 3/4" w Packaging: Standard Packaging includes individually bubble wrapped. Pieces Per Box: 100 Weight Per Piece: 0.14 lbs. Weight Per Box: 14 lbs. Case Dimensions: 16" l x 10" w x 13" h.
ABS Plastic. Easy to Use, No Software Needed. Plug and Play Into PC and Mac Computers Through USB Port. Compatible with Windows 7/ME/2000/XP/Vista and Most Mac Applications. Lanyards available at an additional charge. Capacity from 512MB to 8GB v2.0. 3 Week WorldDirect Delivery. Absolute minimums required. Pricing is directly tied to the volume purchase. No special pricing applies. Please note flash drive samples are subject to availability. Product Size: 3 1/4"h x 2 1/4"w x 333/1000" d Imprint Area: Top 1/2" h x 1 1/2" w Packaging: Standard Packaging includes individually bubble wrapped. Pieces Per Box: 100 Weight Per Piece: 0.05 lbs. Weight Per Box: 5 lbs. Case Dimensions: 10" l x 8" w x 6" h.
512 MB Memory. Save and Access Files Easily and Conveniently. Executive Lightweight Design with Simulated Leather Case. Easy to Use, No Software Needed. Plug and Play into PC and Mac Computers Through a USB Port. Compatible with Windows ME/2000/XP/Vista and Most Mac Applications. Includes a Lanyard. Please note flash drive samples are subject to availability. 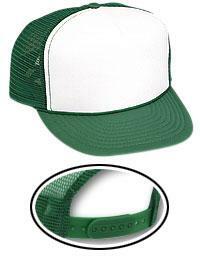 Product Size: 3 5/8" h x 1 1/8" w x 5/8" d Imprint Area: 1/8" h x 1/2" w. Packaging: White Tuck Box and Lanyard. Weight Per Piece: 0.23 lbs Pieces Per Box:: 100 Weight Per Box: 23.0 lbs Case Dimensions: 18" l x 14" w x 13" h.
CF07 is a medium point pen. Both USB Drive and Laser Pointer. Easy to Use, No Software Needed. Plug and Play Into PC and Mac Computers Through USB Port. Compatible with Windows 7/ME/2000/XP/Vista and Most Mac Applications. Capacity from 512MB to 8GB v2.0. 3 Week WorldDirect Delivery. Includes Button Cell Batteries. Absolute minimums required. Pricing is directly tied to the volume purchase. No special pricing applies. Please note flash drive samples are subject to availability. Product Size: 5 1/2"h x 5/8"w x Imprint Area: Barrel of Pen 1/4" h x 3/4" w Packaging: Standard Packaging includes individually bubble wrapped. Pieces Per Box: 100 Weight Per Piece: 0.14 lbs. Weight Per Box: 14 lbs. Case Dimensions: 16" l x 10" w x 13" h.
Other memory capacities available. 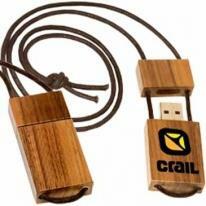 Natural wood casing with memory stick built in and attached neck cord. An Eco-Responsible product. Capacities available: 512MB, 1GB, 2GB, or 4GB Size : 2-1/4"w x 1"h x 1/2"d Imprint Area : 1-1/2"w x 3/4"h Packaging, Standard : Bulk Shipping info: 250 pieces per carton, 15 lbs per carton, carton size 10.00" x 16.00" x 14.00". 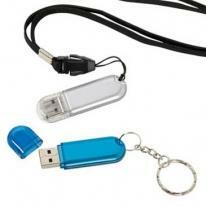 1.1 32MB USB data transfer indicator light. Finish/Material: Brass Imprint Area - Standard Location: 5/16" W x 1 1/2" H Shipping Information: Carton Size: Box Length: 12.80 Box Width: 11.30 Box Height: 15.90 Standard Packaging: Individually Carton Weight: 27 lbs. / 300 pcs. CF07 is a medium point pen. Both USB Drive and Laser Pointer. Easy to Use, No Software Needed. Plug and Play Into PC and Mac Computers Through USB Port. 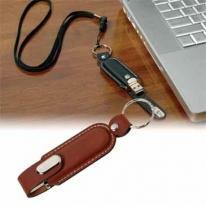 Compatible with Windows 7/ME/2000/XP/Vista and Most Mac Applications. Capacity from 512MB to 8GB in either v1.1 or v2.0. 3 Week WorldDirect Delivery. Includes Button Cell Batteries. Absolute minimums required. Pricing is directly tied to the volume purchase. No special pricing applies. Please note flash drive samples are subject to availability. Product Size: 5 1/2"h x 5/8"w x Imprint Area: Barrel of Pen 1/4" h x 3/4" w Packaging: Standard Packaging includes individually bubble wrapped. Pieces Per Box: 100 Weight Per Piece: 0.14 lbs. Weight Per Box: 14 lbs. Case Dimensions: 16" l x 10" w x 13" h.